As the New Horizons probe moves away and into the Kuiper belt there have been a lot of thoughtful articles looking back at the people responsible for the discovery of this remarkable little world. They have focused mostly on Clyde Tombaugh, the man who spotted Pluto amidst a sea of stars in 1930. Some articles have also told the story of Venetia Burney, the 11-year-old girl who gave Pluto its name, or Percival Lowell, whose obsession with finding “Planet X” inspired Tombaugh’s search. On February 18, 1930, Tombaugh discovered the tiny, distant planet by use of a new astronomic technique of photographic plates combined with a blink microscope. His finding was confirmed by several other astronomers, and on March 13, 1930–the anniversary of Lowell’s birth and of William Hershel’s discovery of Uranus–the discovery of Pluto was publicly announced. In all these stories, though, one name is conspicuously missing: Vesto Slipher. It was Slipher who initiated the planet search and who directed its outcome. He was probably the first to set eyes on Pluto. He was also a meticulous deep-sky observer who collected the first evidence of the expanding universe, more than a decade before Edwin Hubble’s landmark publication that led to the modern idea of the Big Bang. So why is there no Slipher Space Telescope? Why have you never even heard of him and his connection to Pluto? Vesto Melvin Slipher lived his life in the shadow of Percival Lowell, both the the flamboyant man and the namesake observatory that he founded. Slipher joined the Lowell Observatory in 1901 as a 26-year-old researcher, and stayed there until 1952, when he retired as the observatory’s director. This lifelong allegiance both made Slipher’s scientific career and, paradoxically, helped consign it to oblivion. As a privately funded institution, Lowell Observatory could allocate its observing time however its director and founder saw fit. That rare luxury came with a couple distinct tradeoffs. Lowell had a strong set of idiosyncratic scientific passions that guided his observatory’s mission, even many years after his death; and running the place was a full-time job, so in practice the director could not simply put himself in the observer’s chair even if in principle he had the authority to do so. Lowell’s obsession was life on Mars–he was the one who almost singlehandedly popularized the idea of canals built by intelligent Martians–but he also craved acceptance as a serious scientist. Starting in 1909, Lowell assigned Slipher to the task of studying “spiral nebulae.” At the time many people, Lowell included, thought these objects were new stars and planets in the process of formation. Some astronomers were starting to suspect the truth, however: The spiral nebulae are actually spiral galaxies similar to our own Milky Way. Slipher played a key role in that staggering realization. When he measured the velocities of the spiral nebulae he found they were moving at tremendous speeds, far too fast to be a part of our galaxy. Then as he collected more data he discovered that almost all of the spirals were moving away from us, with the fainter ones generally moving more quickly. That is a sign of an expanding universe. Although Slipher did not explicitly make the connection, he clearly understood that the spirals must be other galaxies and that those galaxies were moving in a strange, systematic way. By 1914 he found that 11 of the 15 spirals he had studied closely were fleeing at high speeds. When he presented his results to a meeting of the American Astronomical Society in August of that year, he received a standing ovation–something I have seen happen only once in my life. Slipher was a man on the cusp of a scientific revolution. And then it slipped away. The Lowell Observatory’s 24-inch refractor telescope was a fine instrument, but too small for studying even dimmer, more distant galaxies. Percival Lowell died in 1916 and Slipher became increasingly involved in the running of the observatory. He was modest by nature (which made him a highly effective manager) and soon found himself shunted aside by someone with no such shortage of ego: Edwin Hubble. Using the giant 100-inch telescope at Mount Wilson, Hubble was able to do what Slipher could not: measure the true distances to the spiral galaxies, essential for showing that there is a direct relationship between a galaxy’s distance and the velocity at which it is moving away from us–the clinching evidence of cosmic expansion. Incidentally, Hubble did not measure the velocities himself, only the distances. So where did he get that information? Right–from Slipher. Hubble met with Slipher in 1928 and apparently did not reveal that he was using Slipher’s data for his cosmic census. The following year, Hubble announced the systematic fleeing of the galaxies, with barely any acknowledgement of Slipher’s role. The discovery became known as Hubble’s Law, and the unassuming Slipher never objected. At least the story of Pluto’s discovery does not have the same taint of injustice hanging over it. Once again, the impetus for the research came from Percival Lowell, whose other scientific obsession had been the search for a new planet beyond Neptune. (His motivation, according to Tombaugh, was to increase his credibility so more people would join him in his quest for life on Mars.) In 1929, Slipher initiated a systematic search for Planet X in Lowell’s honor. Lowell had deduced that Planet X was likely to be found somewhere in the constellation Gemini (using erroneous logic that turned out to be incredibly lucky), so that is where Slipher began to look. Tombaugh took the photos, Slipher and examined them, working in conjunction with his brother Earl Slipher, also an astronomer. His process was to look back and forth between paired photos of the same section of sky, a technique called “blinking”: If a planet was orbiting along among the stars, it should appear to blink from one spot to another in the two photos. Poor Slipher. He tried to tackle this incredibly subtle and tedious job while working as the observatory’s director. He spent several weeks touring through the stars of Gemini before giving up and turning the project completely over to Tombaugh so that he could keep exploring new stretches of the sky. As Tombaugh settled into the job, he realized that Slipher had been going too fast; spotting a dim, distant planet required more attention than Slipher had been able to muster. Tombaugh circled back to the original patch in Gemini and re-photographed it. On February 18, 1930, Tombaugh spotted Pluto. It was near where Slipher had begun his search. 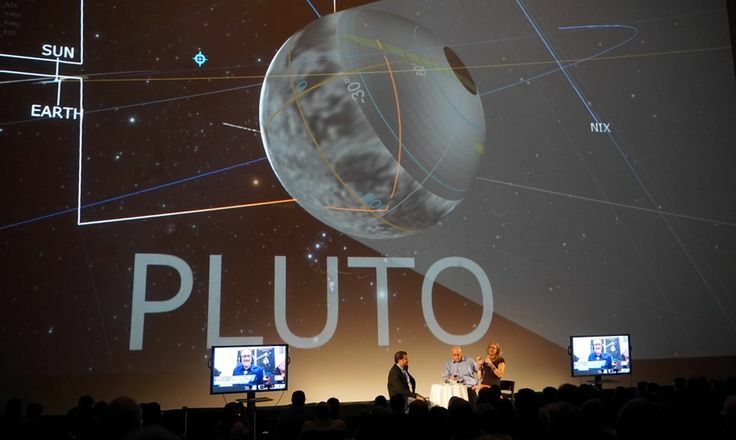 In all likelihood, Slipher had looked right at Pluto without recognizing it. True to his nature, Slipher expressed no regrets or frustrations about not being the one to find Pluto. More significant, he did not try to share or steal credit from Tombaugh. He could easily have told the press that Tombaugh was a hired assistant who was working on his project under his instructions–which was technically true–but that was not the way he operated.